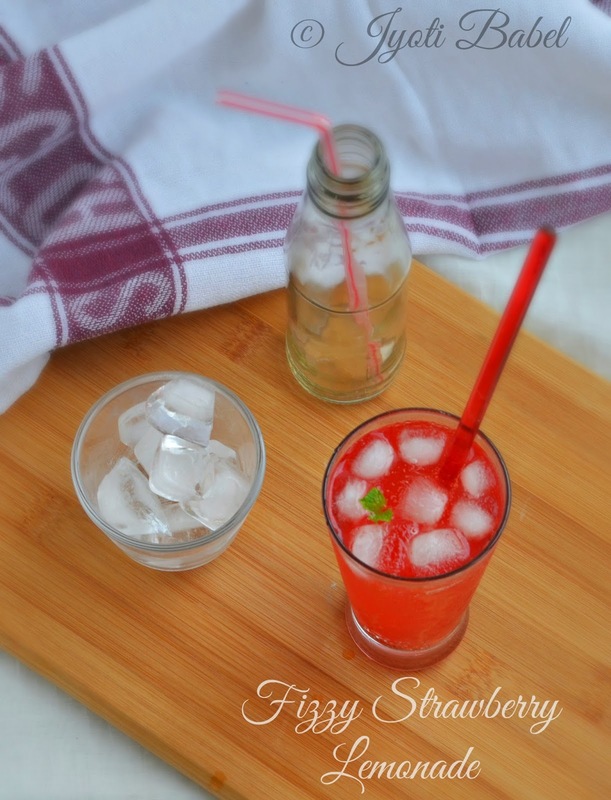 This Fizzy Strawberry Lemonade Recipe is a pretty instant one. Whenever you feel the summer blues melting you down, sip on this and chill. Summer is here in full spat. The sun shines brightly all day and keeps the mercury soaring relentlessly. Of course, there is some respite in the evening when the cool breeze blows, but for the most part of the day, you can feel the heat all the time. 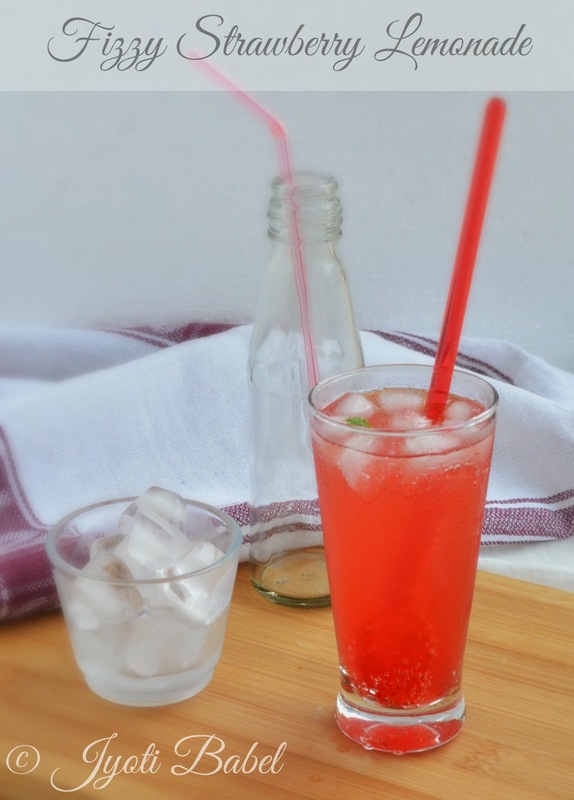 In order to enjoy summer make summer bearable, we can obviously enjoy chilled drinks. Coz, when the rain hits (which should happen in a couple of weeks), you won't be able to sip on chilled drinks as much. For those will be the time when you will want to gorge on some Onion Bhajji and Masala Chai. 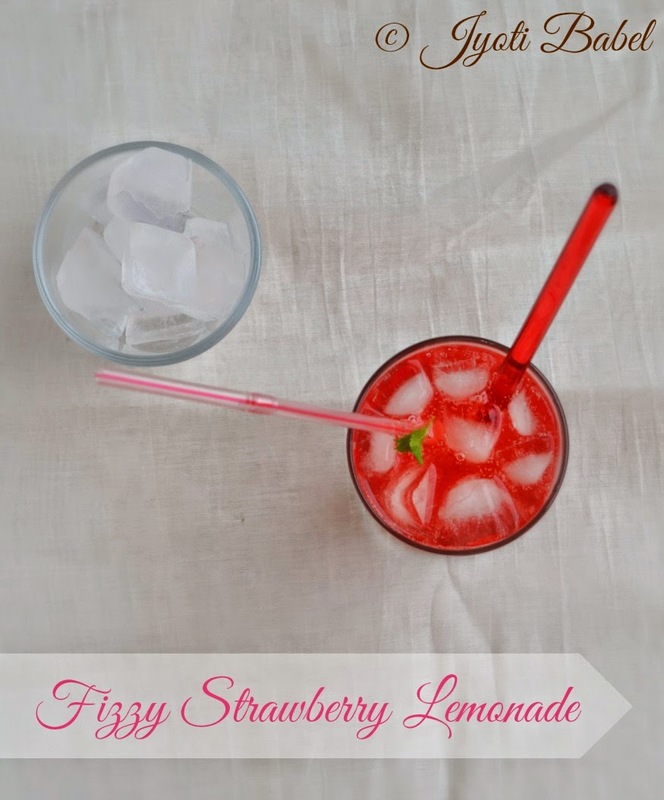 So, for now, keep your spirits up with this 'Fizzy Strawberry Lemonade'. To tell you the truth, what I am sharing today is not really a recipe, but just a mixing of ingredients. Unless of course, you want to make the strawberry syrup from scratch. If you would like to do that you can refer to this post to know how to make the syrup. Here I have used the ready made strawberry syrup from Mapro for the sake of convenience. Add the strawberry syrup to a tall glass. Add ice cubes. Top it halfway with Sprite or 7-Up. Stir nicely. Add more Sprite or 7-Up to fill the glass. Garnish with mint sprig. Serve immediately. - Prepare it right before serving to maintain the fizziness of the drink. Enjoy! Thank you for stopping by! This looks so refreshing!! Will try this someday. Thanks for sharing. can we make strawberry syrup at home? Mindblowing lemonade,cant resist to it.